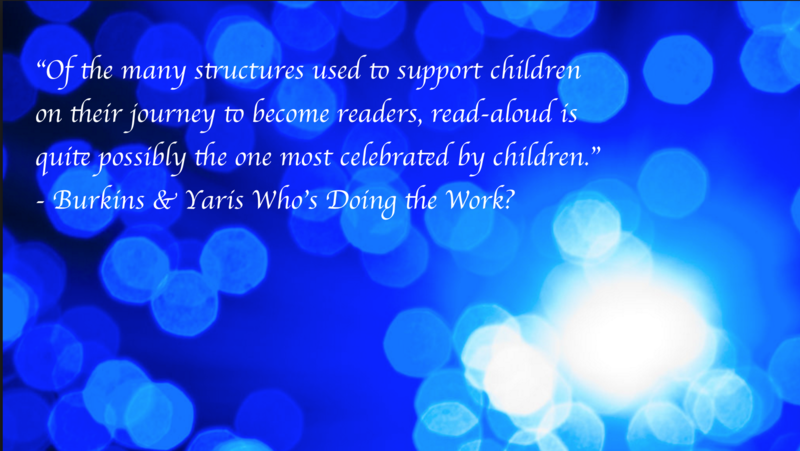 How can we use read-aloud as a springboard to reading, writing and thinking? 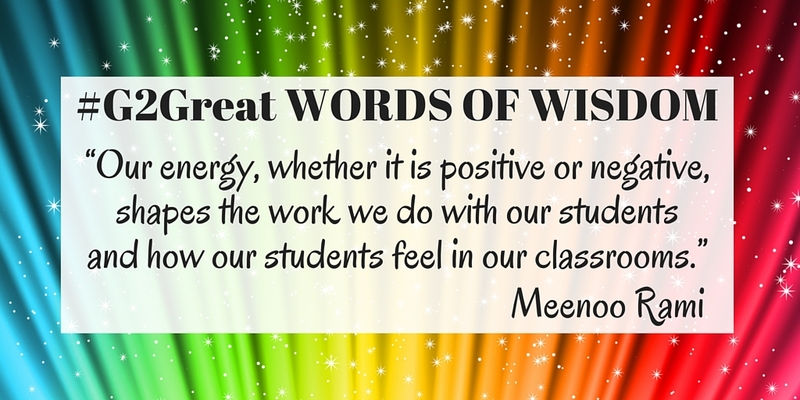 This was the question that sparked the first of a #G2Great four part series: Teaching With Intention Maximizing Our Instructional Power Potential. 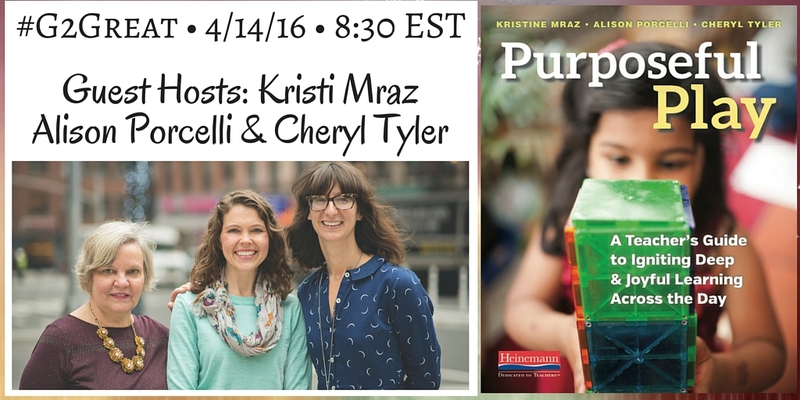 Our chat on April 21, 2016 has come and gone but I am left feeling refreshed and renewed as I begin this post. Even though educators came to this conversation from different points in their careers, everyone learns from each other. What does this plurality of thinking offer us? Clarity. It is that clarity and our ability to respond to our own questions about read-aloud that help us to maximize our professional potential. Q1 How can we more intentionally frame read-aloud to increase student engagement in ways that maximize our instructional POWER POTENTIAL? 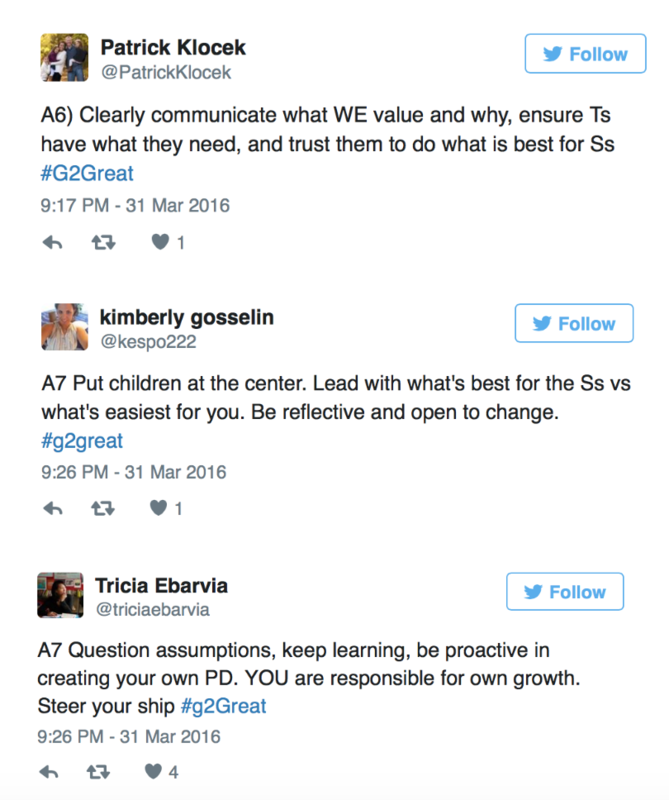 Q2 What do you look for when using read-aloud as a flexible instructional springboard? Q3 Read-aloud is a powerful framework to build language & vocabulary. What can we do to intentionally enhance those goals? 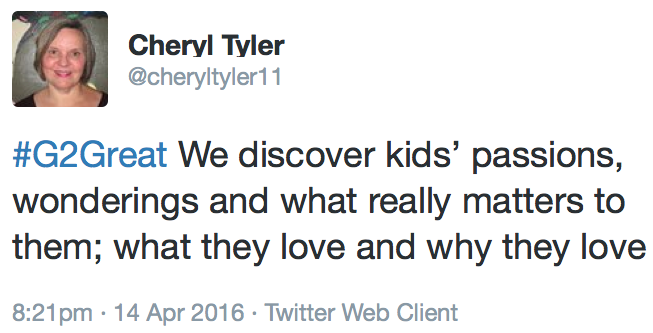 Begin by starting with texts that you love, then find out what your students love. How do we use this fertile ground to grow relationships? Instructional planning is organized around meaning making. How do my students learn best so they can access this text? Whenever we stop the flow of the story be mindful of the enjoyment factor. How do I use the structure of different genres to select my stopping points and demystify the author’s craft? Build vocabulary lessons from context to allow students to practice and transfer. How can I use the classroom environment to promote transfer for all students? 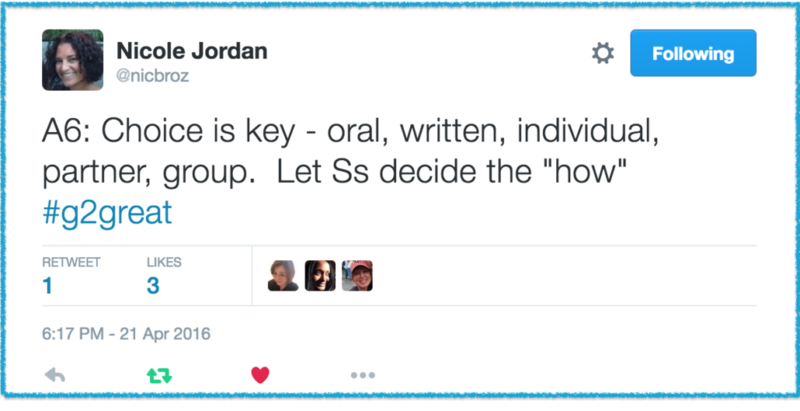 Q4 Peer collaboration and sharing is a crucial aspect of read-aloud. 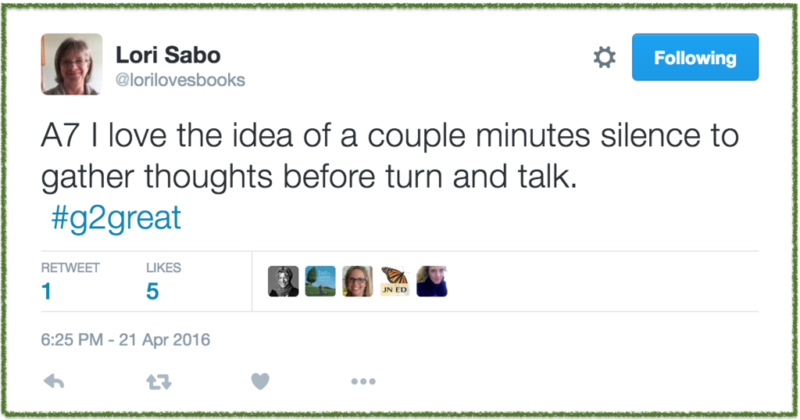 What is your favorite approach to bring readers and books together? Q5 How can we integrate writing so the writing will elevate the academic AND emotional experience of the read-aloud? 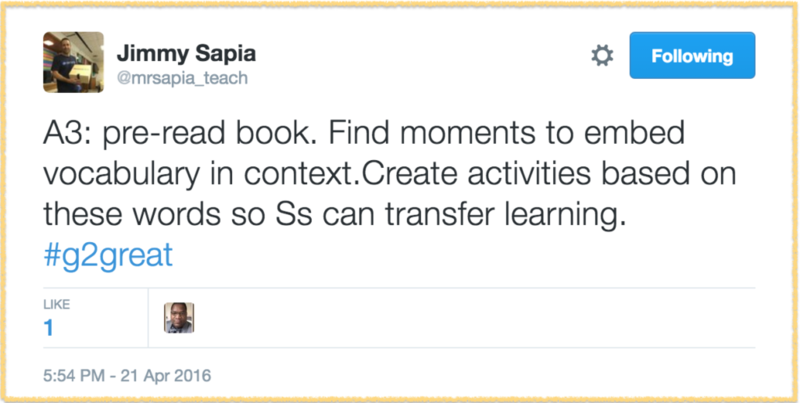 Q6 Varied flexible reflection options after read-aloud allow us to create a more personalized experience. What options do you offer? 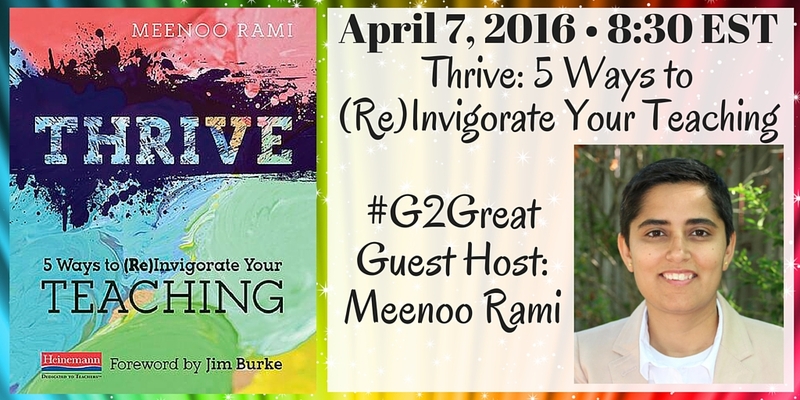 Q7 Based on #G2Great chat tonight, what is one instructional shift you will make so that your read-aloud is more intentional? Each Thursday night #G2Great teachers from all over the world come together to do the work that we need to do to become more skilled at our craft. To think about ways that will help our students thrive and grow. Thank you for helping me to think deeper and longer so that I can continue to grow my practice. As each of us grow together, it is our students who reap the benefits of our collective learning. Charlotte Danielson has observed that teachers make over 3,000 decisions a day. These decisions have been categorized by Danielson as “nontrivial” meaning that they are more complex and more significant than one might at first imagine. These decisions impact the small humans we teach each and every day. The educational journey of each student is impacted by those 3,000 plus decisions we make each day and, therefore the call to be thoughtful weighs even greater in our minds as educators. This practice of decision making and thinking resonates even more with me as I continue to reread and reflect on the book Quiet Leadership by David Rock. He suggests that when we work in a field that compensates us for thinking, the way to improve performance is to improve thinking. This is different from previous management models left over from a time when most workers were focused on processes. 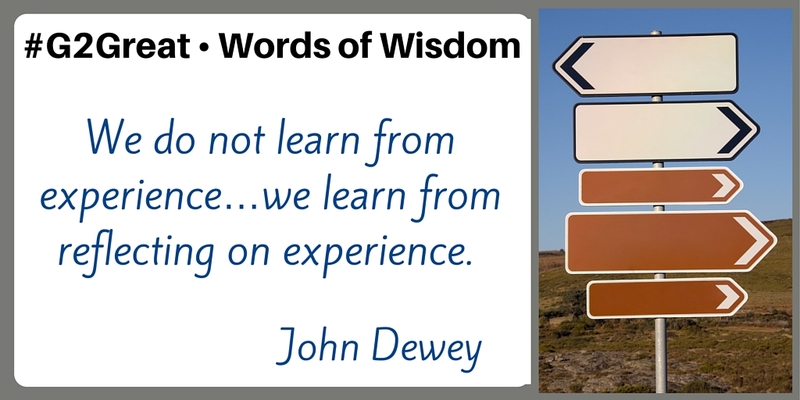 Therefore in considering thoughtful decision making it seems that if we improve thinking we improve decision making and overall we improve the learning experiences for our students. Simply stated, when we improve our thinking we improve our students’ thinking. 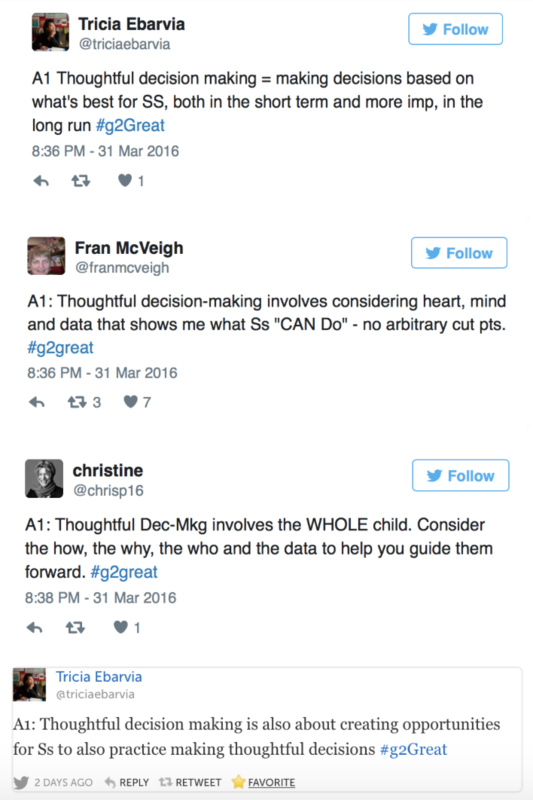 On March 31, 2016 #G2Great we came together to deepen our understandings around thoughtful decision making. During our weekly chat, we often begin by sharing quotes from leading thinkers who make us think deeper. 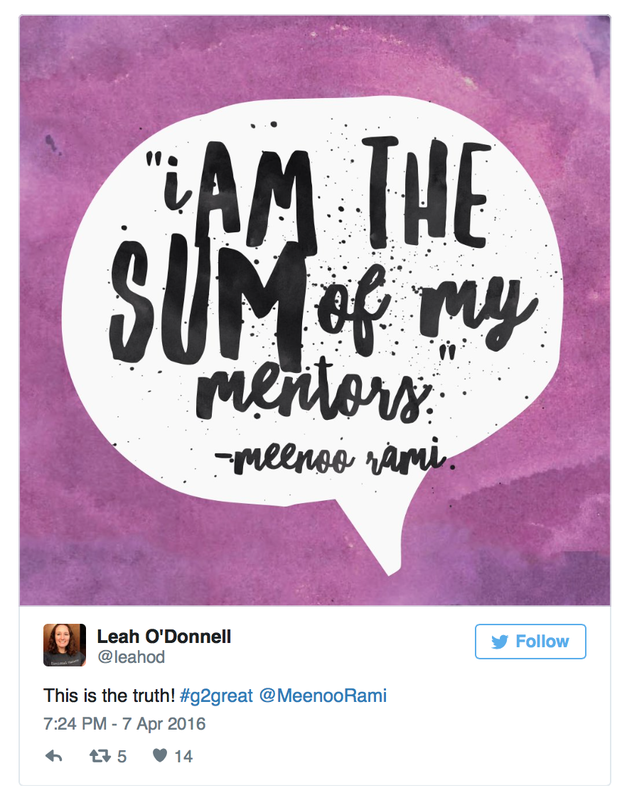 As an extension to our Thursday night #G2Great chat, I will return to some tweets and highlight thinking around these quotes that generated collective discourse. 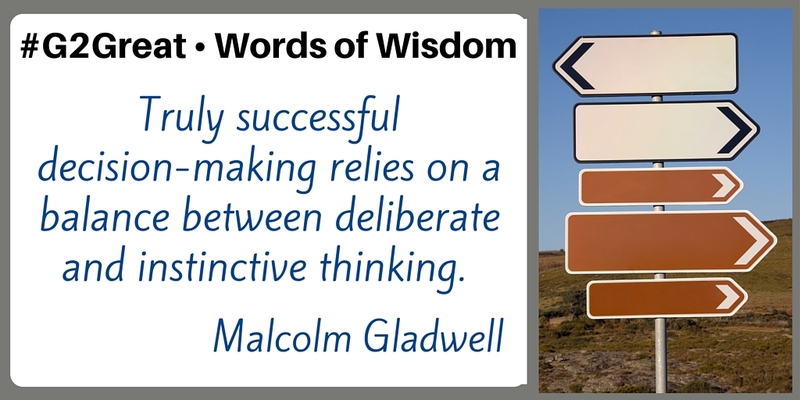 The potential of our instructional power is at its greatest when we balance instinct with deliberate thinking around our decisions. Instinct comes from the experiences that are already hard-wired into our brain as maps. 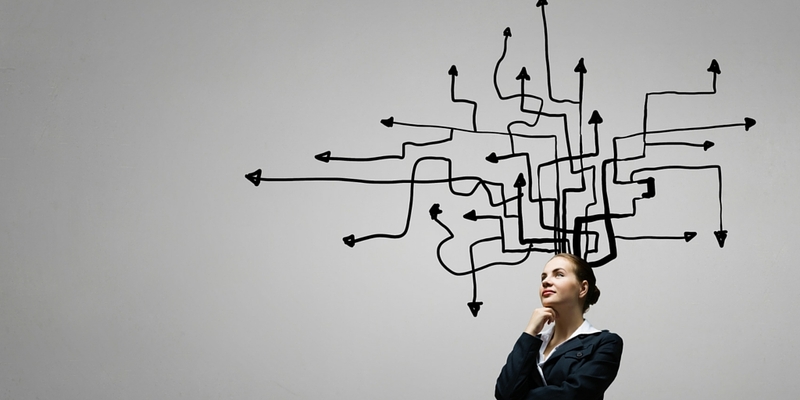 We know or can predict the outcome of certain situations and this needs to be in balance with intentional thinking when making these 3,000 decisions each day. Thoughtful decision-making is at the heart of all great teaching and learning; great teachers put students at the center of those decisions. 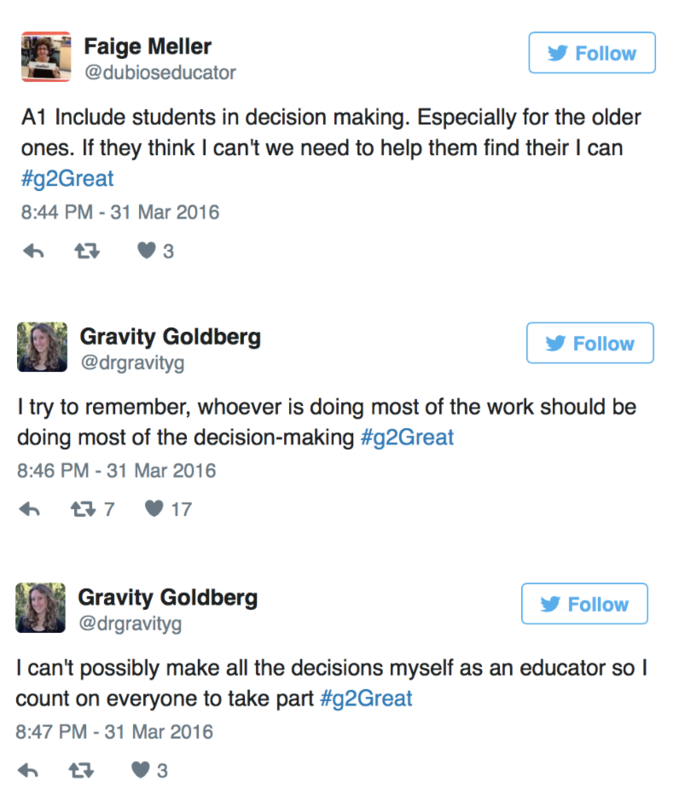 Take a look at the tweets shared out and it will be easy to see how we as educators put our students at the center of our thinking and decision making. 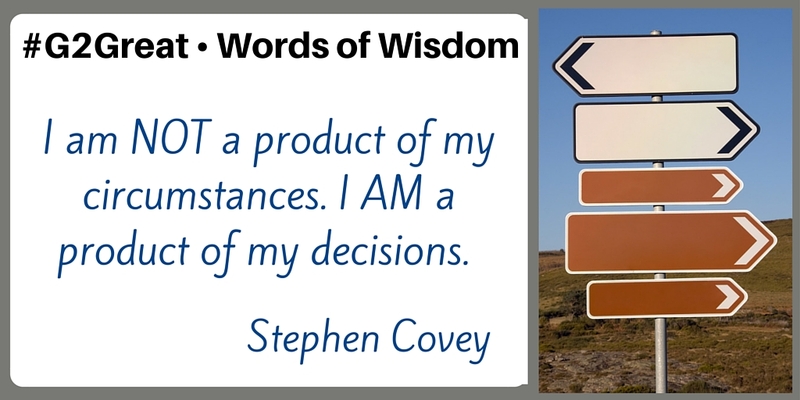 If we let this quote from Stephen Covey inspire our thinking it won’t take long to realize that our classrooms are the residual outcome of our decisions. In maintaining our belief that students are at the center of our classroom then we could argue that student decision making then also results in the learning process that can be seen in our classrooms. John Hattie has said about our students, “Give them the skills so they can be their own teacher. We truly make a difference when we teach students to see their impact, they become more engaged in this thing we call school.” When we join together as collective learners in our classrooms we can make a difference, involving students in classroom decisions is a powerful way to advance learning. In fact if you look at rubrics used for teacher observations (Charlotte Danielson’s Framework or the NYSUT Teacher Practice Rubric) in the distinguished or highly effective column and multiple times across different domains or standards you will see descriptors that include actions on the part of the students. Releasing responsibility to students is valued across these areas and has a correlation to their learning processes. When students are involved in the teaching and learning not only are they invested in their learning, they learn that they have something to do with their own success and this will not only engage them as Hattie pointed out, but build intrinsic motivation. 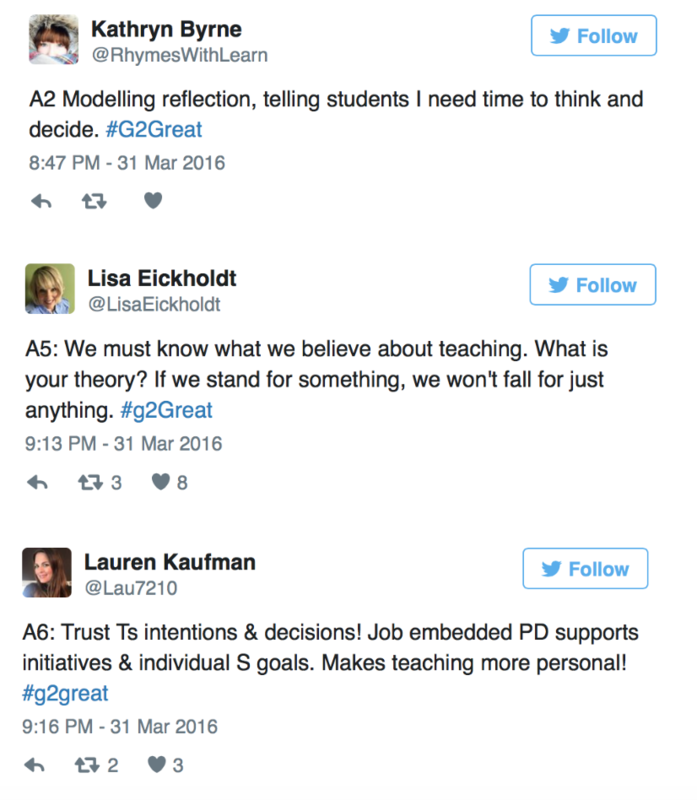 The process of reflection was the focus of our #G2Great chat while our blog is really a tribute to the words that are tweeted out into the Twitterverse each Thursday night at 8:30pm EST. As we think about thoughtful decision making we have to consider all that we learn from the reflection piece of that process. Especially powerful is the opportunity we have to reflect with others, while we can do this in person or with our PLN in a virtual sense, the process is the same. David Rock has said, “Making decisions can be a difficult process, and having a sounding board can make a big difference.” The additional benefit of this collaborative reflection as Rock points out is that “having others stretch us is a way to grow faster than we would on our own.” Each and every week at #G2Great I am grateful for the opportunity to meet with others who reflect and stretch my thinking and decision making in a way I cannot on my own. Grateful for reflection. Grateful to share thinking. Grateful to grow and learn. Grateful for all the tweets that inspire great work.